I needed a hike today for my Hike366 project so I texted my friend Sarah to see if she was available. We decided to meet at a coffee shop downtown and then walk the Deschutes River Trail until we ran out of time. It’s easy to take a hike in Bend. 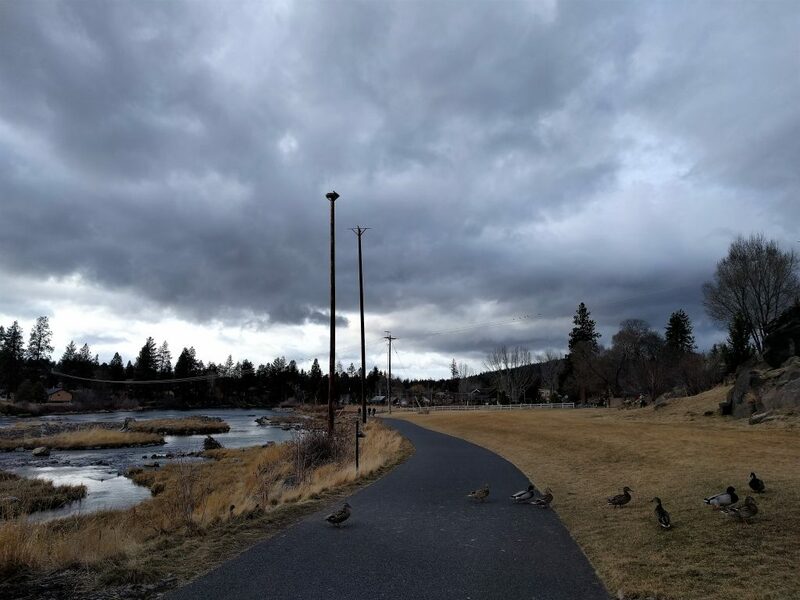 The Deschutes River Trail, which covers 20 miles from end to end, runs straight through the middle of town. It’s a convenient place to take a stroll whether you’ve got 5 minutes or 5 hours. Today we had just under 2 hours, since we parked downtown and didn’t want to get a ticket. It was a chilly, moody day. Bend is well-known for “300 days of sunshine.” Well, today was not one of those days. Nonetheless, we sipped our coffee, caught up on life and walked on the trail through downtown, Drake Park and the Old Mill. We stopped across from the surf wave to watch people in their wetsuits try and catch the wave. Then we turned our attention to the large numbers of waterfowl enjoying the natural side of the river. We ended up waiting longer than we’d anticipated as a huge caravan of ducks slowly plodded across the path. They were adorable to watch. Heading south, the pavement eventually turned to dirt and it finally felt like we were on a hike. From here the Deschutes River Trail gets a bit wilder. But we wouldn’t have much more time to explore. The clock was ticking. I love living in Bend. It’s so easy to find a trail and start walking. But the face of Bend is rapidly changing and I wonder how things will look ten years from now. I hope that we are able to preserve access to wild spaces and contain development as much as possible. This entry was posted in Hiking, Oregon and tagged hike366 on February 3, 2018 by Jess B.